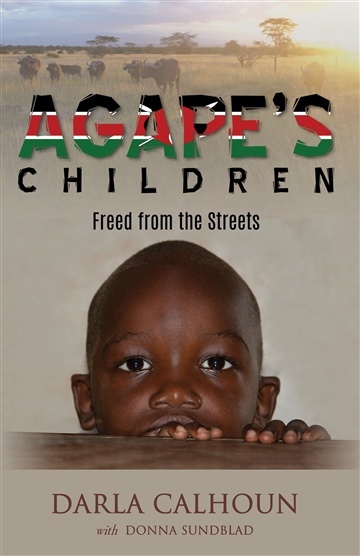 Agape’s Children is the heart-warming story of how an ordinary woman responded when confronted by child beggars in Kisumu, Kenya. Darla’s story of how she rescued street children and transformed their lives by the power of God’s love, will grip your heart. Can one person really make a difference? These boys and girls, rejected by their own, hooked on glue, and sick with scabies, HIV, or worse, often run from help. How much love does it take to reach beyond their outward appearance to redeem the lives of these little people? As much love as one can give, and then some. It requires Agape love, the kind that comes from God. On the inside, these street children are as real as you or I. Their spontaneity will make you laugh. Their vulnerability will make you weep. And their responsiveness to the gospel of Jesus Christ will encourage you to rejoice. They are so real, Darla knew without a doubt that God loved them deeply, and He told her to do the same. Today, instead of nearly one thousand children in the streets of Kisumu, only one hundred and sixty remain. Instead of growing up to be street thugs, these little champions are being reintegrated with family, winning achievement awards at school, and blossoming in Christ. Darla and the Agape team are changing the world, one little boy and girl at a time. believe it? From California to Kenya, Darla Calhoun said yes…and she went. street children in Kisimu, Kenya has been significantly reduced. remarkable insight into the life of a missionary. family counselor and author of over 130 books on various subjects.